The choices to control your fan vary as widely as the choice of fans. Speed Controls. These are fairly self explanatory, they allow you to adjust the speed of the fan itself. Typically used in kitchens because the ventilation needs vary by what you are doing, we have also used them in Duct Boosting applications to set the fan at the most efficient setting for the job. We have ones that look great and those that didn’t go to prom, as well we have models that will take quite a bit of voltage. Themostats. We use these to turn on attic fans as well as garage fans when temperatures build up. The most popular use is actually in A/V applications. We have a model that will switch high voltage (110v) so that eliminates the need for relays and ancillary wiring. Humidistats. These are used to measure moisture content in the air and turn on a fan to vent an area. Usually under a home, or in a barn or other outbuilding. These are nice, because they do the remembering for you, so you needn’t worry about whether the fan was turned on. Take the stress off, your plants! 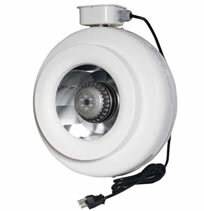 Another great addition to our lineup: The Ostberg CK series inline hydroponics fans. Keep the temperature down and prevent stress on your plants through proper ventilation. These puppies are designed for tough high static pressure applications such as carbon filters and humid grow room environments. The tough baked epoxy coating and a 10 year warranty are icing on the cake.